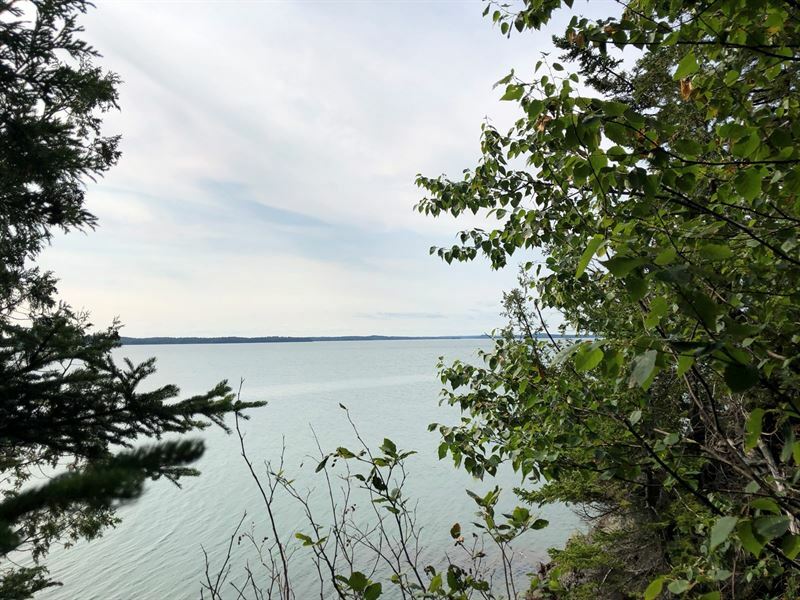 Oceanfront acreage for sale in Lubec, Maine - Wildlife abounds on this 147+- surveyed acres of fields, woods and pristine beauty. The 2434+' on the deep waters of South Bay has numerous vistas on which one can build their dream home. The property is wooded with mature spruce, fir and cedar. Harvestable wood can help reduce your cost for expanding and improving the road to the shore. South-West exposure at the shore offers gorgeous sunset views over the waterfront. Relax on one of the many little points and watch the seals below as they search for their daily food, enjoy the eagles as they fly overhead, then swoop down to grab their catch of the day. This is a great location for a hobby farm or to start a self-sustaining farming enterprise. There are fields to mow and plant or use for grazing, wood to cut and wildlife to hunt. Deer, grouse, rabbits, an occasional moose, fox, bear and other wild animals call this area home and so can you. Call today for more information. The town of Lubec is a coastal community with a population of 1300 hundred and attracts summertime visitors from across the US and other countries. It is the most easterly town in the US and home to the famous West Quoddy Head Light House which marks the most easterly point in the United States and greets the sun first each morning as it spreads its rays across our nation. Lubec has over 90 miles of shorefront and the area offers over 12,000 acres of preserved public lands and parks. Take a hike on one of the many trails at West Quoddy Head State Park, Hamilton Cove or the Pike Lands grab your kayak or canoe and launch from any number of public sites to experience the ebb and flow of our great tides and explore the island studded bays. Lubec is also home to Summer Keys - a music program that attracts adult students from all over. They come here every year for a week or two to study with artists that have mastered their chosen instrument and on Wednesdays the staff put on a grand concert - free to the public. There is so much to share - from the pristine beauty of the area, the diverse programs offered in the summer, the sleepy winters that bring about winter activities - both indoor and out. Known as the Sunrise County, Washington County welcomes the first rays of sun to shine on the U.S. each day. With tides averaging between 18-22' the bold, salt-sprayed shoreline of Downeast Maine offers deserted beaches, quiet hiking trails, rugged cliffs and untamed beauty. Truly one of the last frontiers on the Eastern seaboard, one doesn't have to go far to enjoy the natural beauty of the area. With 2 cities, 44 towns and a population of approximately 32,800, Washington County is larger than the states of Delaware and Rhode Island combined. Deer, grouse, rabbits, an occasional moose, fox, bear and other wild animals call this area home and so can you. Call today for more information.